Yesterday was a gorgeous day to head into Yellowstone Park which is only a two hour drive from home. I've never gone into the park quite this early before so it was interesting to see the park in springtime with a considerable amount of snow still on the ground in spots. The closest entrance to the park from where I live is the West Entrance through West Yellowstone, MT. From there, it's about another 14 mile drive to Madison Junction where you take a right hand turn to Old Faithful at Madison Junction. First stop along the way was the Fountain Paint Pot Trail, featuring geysers, mud pots, hot springs and fumaroles along a boardwalk. Plenty of geothermal activity to witness here. Next stop was Old Faithful, another 17 miles or so down the road past lots more large animals alongside the road to thrill tourists and onlookers. This stretch has some beautiful fly fishing water along the well renowned Firehole River. There were plenty of people out trying their luck on the Firehole yesterday, casting along the river's edge with steaming vents encircling them. When we arrived at Old Faithful, we had just missed the geyser so we had about a 45 minute wait for the next "performance" so to speak. We walked around and listened to the narration of the park ranger who was making the most of entertaining the huge crowds. Finally, after a long wait, Old Faithful erupted in typical geyser fashion and gave a rather short performance although it was well received by all. Having such a short amount of time to see as much of the park as possible, we opted to head to Yellowstone Lake in lieu of doing the entire loop that runs from Madison Junction to Old Faithful, Yellowstone Lake's West Thumb, then on to Fishing Bridge, around to Canyon Village and through Norris back to Madison Junction and then on to West Yellowstone. When we started climbing in altitude to Yellowstone Lake, we climbed to 8,391 feet asl where there was still quite a lot of snow on the ground and the lake was still a good bit frozen, although much of it was melted. We encountered a small grizzly bear that looked like he was having great difficulties coming out of hibernation, skinny and sickly looking. I'm not sure what was wrong with him but he didn't look good at all. That's about as far as we had time for in one day, so we turned around and headed back to West Yellowstone, stopping along the way for more photo ops and large animal sightings. All in all a great day in the park, which would only have been better if I'd had my fly rod in hand on the Firehole! So, we gave Oregon a shot and it just didn't work out. 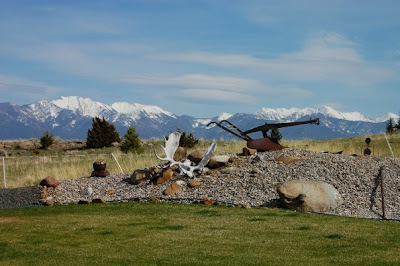 Between my horrible joints that hated the climate and the lack of open spaces, I decided I needed to return to southwest Montana where I've lived the last 11 years quite comfortably with the exception of the long winters. I'm going to work on that though and figure out a place to go for winter. Upon departing Roseburg, Maggie the wonder dog and her feline pal (and sister) Madison and I took to the road and pulling our new (well, new to us) 1970 Aristocrat camp trailer decided to take a few days and camp out in Sisters, OR in search of morels and boletes and whatever else we could muster up. Maggie had a great time playing with her doggie pals Mazey and Ruby and Madison sat in the window most of the time or hid and slept all day so she could pester the crap out of me all night long while I was trying to sleep! Have you ever tried camping with a cat in tow? It's not a particularly fun thing to do, traveling with a litter box in cramped quarters. We met up with friends out at the Jack Creek campground about 18 miles from Sisters, which was quite a peaceful place to camp once the weekend warriers departed Sunday afternoon and Monday morning. The mushrooming was not as good as we'd hoped it would be. There were no boletes popping yet and the burn that had been producing had been so pounded by commercial pickers there were no morels to pick including babies. There were scads of pickers and buyers and virtually no mushrooms to go around so it seemed like a bad dream. We did manage to get out and find some natural morels though which is a treat for me, not having any natural morel spots in which to forage in Montana. After four nights at Jack Creek, Maggie, Madison and I continued our trek back to SW Montana overnighting in Connell, WA and then finally making it back here late afternoon through rain, high winds, snow and crazy weather. 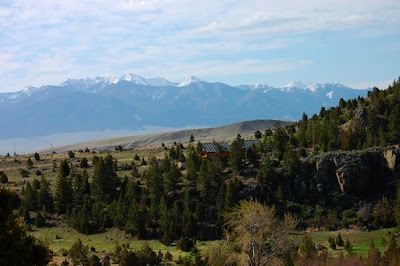 Now we are getting settled in Montana and enjoying life staying with a friend in the Highland Mountain foothills and especially enjoying the beautiful sunny, warm weather. It's good to be HOME!